The remaining two brush classes are LinearGradientBrush and PathGradientBrush; the word gradient here refers to a transition between colors. LinearGradientBrush involves a transition between two colors, sometimes called a fountain. At first, it may seem complicated to define a way in which one color merges with another, and that's probably why there are a couple different ways of specifying such a brush. 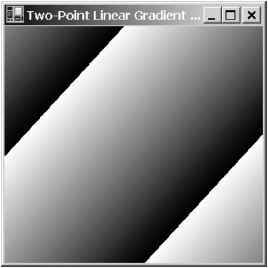 The linear-gradient brush is thus an infinitely long stripe with two parallel borders of two colors. Note that there are an infinite number of pairs of points that result in the same linear gradient. I'm going to refer to the line connecting those two points as the gradient line. 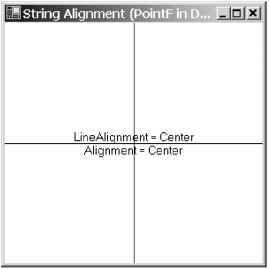 I also want to define the term mix line as the line at right angles to the gradient line and parallel to the two border lines. The only difference between these two constructors is the use of either Point or PointF structures. The points are in world coordinates. 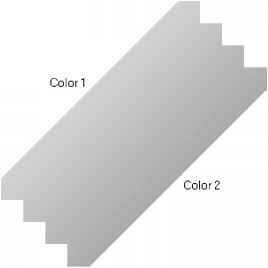 The color at the first point (pt1 or ptfl) is clrl, and the color at the second point (pt2 or ptf2) is clr2. Let's take a look at a program that creates a LinearGradientBrush object in its DoPage method, defining the first point as (cx/4, cy/4) and the second as (3*cx/4, 3*cy/4). The two colors are Color.White and Color.Black. The program then colors a rectangle the size of its display area with this brush. The wide continuous stripe from the lower left to the upper right is defined by the two brush coordinates. On either side of the stripe (in this case, the upper left and lower right of the client area), the stripe is repeated. This behavior is controlled by the WrapMode property of the brush. WrapMode.Tile (the default) is the same as WrapMode.TileFlipY, and it causes the brush to be tiled with no flipping, as shown previously. WrapMode.Clamp is not allowed for linear-gradient brushes. Let me emphasize again that any Fill method you call with a particular brush essentially provides only a window through which you view the brush. When using texture brushes or gradient brushes, the appearance of any filled area depends to some degree on where the area is drawn. If you draw a small rectangle using the brush defined by the TwoPointLinearGradientBrush program, it might not even seem like much of a gradient. Notice that for the last two enumeration values, two opposite corners of the rectangle define the mix line rather than the gradient line. Although the two other corners of the rectangle are pure colors and the border lines pass through those two corners, those two corners do not define the gradient line unless the rectangle is a square. Let's take a closer look. 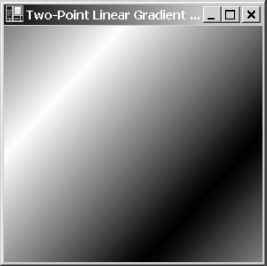 The following program defines a linear-gradient brush based on a rectangle that is half the width and height of the display area, and centered within the display area. You can use the menu to set the constructor's LinearGradientMode argument. After filling the display area with that brush, the DoPage method also draws the rectangle used in creating the brush. Although the upper left corner of the brush rectangle is colored with the first color and the lower right corner with the second color, the gradient line is obviously not the line from the upper left corner to the lower right corner because the gradient line is always at right angles to the border lines. Instead, the mix line (parallel to the border lines and midway between them) passes through the upper right and lower left corners of the rectangle. If fAngle is 0, the effect is identical to LinearGradientMode.Horizontal: the gradient line is horizontal from the left side of the rectangle to the right side. As fAngle increases, the gradient line rotates clockwise that number of degrees. The upper left corner of the rectangle is the first color, and the lower right corner is the second color. When fAngle reaches 90 degrees, the effect is identical to LinearGradientMode.Vertical: the gradient line is vertical from the top of the rectangle to the bottom. As fAngle increases beyond 90 degrees, the gradient line continues to rotate clockwise. But now the upper right corner of the rectangle is the first color, and the lower left corner of the rectangle is the second color. The optional bScale argument indicates whether the rotation angle is scaled by any transform associated with the brush.